The soil sample weighting 30 grams is placed in a porcelain evaporating dish about 115 mm dia., shaped into a smooth layer approximately 10 mm thick at the centre and divided into two portions by means of a grooving tool of standard dimensions. The dish is held firmly in one hand and tapped lightly ten times against the palm of the other hand. If the lower edges of the two soil portions do not flow together the moisture content is below the liquid limit. If they flow together before ten blows have been given, the moisture content is above the liquid limit. The test is repeated with more or less moisture as the case may be until the two edges meet exactly after ten blows have been given. A mechanical device, called “Crank and Cam Device” is used in most of the laboratories. 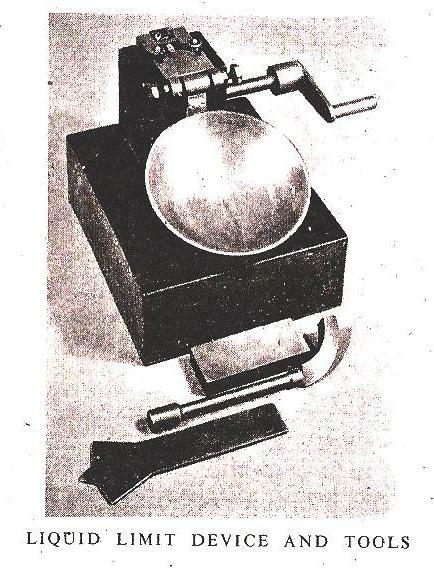 In this device a brass cup is raised 1 cm above a flat base and then dropped by rotating a handle. The LL is the moisture content when the soil sample flows together for 12 mm along the groove with 25 shakes at 2 drops per sec. Weight of the sample is 100 grams and passes the 425 micron (No. 36 BS) sieve.